Obama opposes it. A possible veto-proof majority looms. The legislation aims to undermine consummating a final deal by giving Congress vetting power over its terms. Israel and its Lobby want them tougher than any responsible government would accept – their way to kill an equitable deal altogether. Congress is on board to oblige. More than 50 amendments are being considered. On April 14, Senate Foreign Relations Committee members will begin debating them. Obama wants no congressional action until a final deal is reached by end of June. All 535 congressional members know Iran’s program is entirely peaceful – with no military component or intention to have one. They know Iran doesn’t threaten Israel or any other nation. It’s leadership goes all-out for mutual cooperation with all other countries. Israel, Obama and pro-Israeli zealots infesting his administration know all of the above. They fabricate accusations claiming otherwise. They deplore peace and stability. They relish endless wars. Reports indicate intense negotiations over ways to amend INAR – largely irresponsibly. Current provisions let Obama lift Iranian sanctions by executive edict. At the same time, it prohibits him from acting for 60 days. During the period, Congress would review and have final say up or down. Ranking Senate Democrat Foreign Relations Committee member Ben Cardin and several likeminded party colleagues propose letting Obama lift sanctions as long as not in violation of any final deal. They want a shorter congressional vetting period – from 10 to 30 days instead of 60 Republicans demand. They want a provision eliminated requiring Obama to certify Iran hasn’t conducted or supported an act of anti-American terrorism anywhere worldwide. Republican hardliner/presidential aspirant Senator Marco Rubio wants Obama required to certify Iran publicly accepted Israel’s right to exist – something totally unrelated to provisions negotiated so far nor will it be. It’s a deal-killer. Iran won’t accept piling on requirements unrelated to its nuclear program – not should it. Another possible deal-killer is requiring any final deal be in treaty form requiring two-thirds Senate approval. Senator John Barrasso proposes Obama certify any funds Iran receives following sanctions relief not go for nuclear weapons development and production, ballistic missiles or terrorism. He says he won’t introduce his amendment as long as Democrats don’t weaken the already tough bill he supports. Republican Senator Johnny Isakson wants Congress demanding Iran compensate 52 Americans held hostage from November 1979 to January 1981. Otherwise no deal. No sanctions relief. No establishing diplomatic relations with Iran. If a final deal is consummated, America’s longstanding record shows it won’t be worth the paper it’s written on. It’s virtually certain Washington will breach it like all other treaties, conventions and agreements it signed on to. The whole world knows Iran has no nuclear weapons, isn’t developing any, wants none, and is the leading proponent for a nuclear-weapons-free world. Talks with Iran “are about policing America’s interests in the Persian Gulf,” Francis Boyle explains. They’re to reestablish Washington’s pre-Iranian revolution relationship. 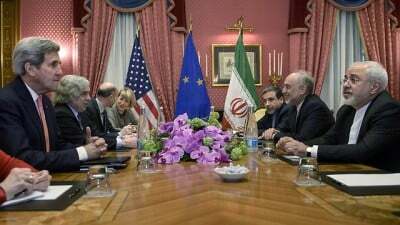 They’re about “reintegrating Iran into the US imperial order,” Boyle stressed. They’re to strengthen America’s regional dominance partnered with israel. Everything else is meaningless window dressing.